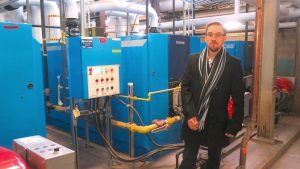 Project director Cedric Bertrand checks that all is well with the new 850-ton York CYK heat recovery chiller at Laval University Hospital. In 1519, during the Spanish conquest of Mexico, commander Hernán Cortés ordered his troops to burn their ships after landing so that they’d be forced to conquer or die. It was his way of getting his team to focus on the outcome without distraction, fix their eyes on the prize, garder l’oeil sur le but (Keep your eye on the goal). Focus is also critical to construction and mechanical professionals, especially those working on large institutional projects, over long timelines, with seemingly impossible objectives. 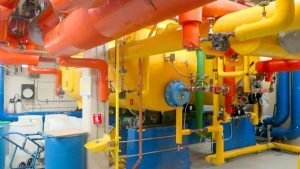 Quebec City engineering firm EcoSystem continues to win awards, including two in 2018 from ASHRAE, for their work on complex asset renewal projects for a group of Quebec hospitals. We don’t like change orders, so we focus on the day-to-day details, and we have gotten good at setting a cost target and then hitting it. The Laval upgrade included new hot water tanks and piping. Bertrand was responsible for Laval University Hospital (Centre hospitalier de l’Université Laval), a 1.3 million square foot facility that’s almost 100 years old. The mechanical equipment positioning and some of the HVAC equipment seemed as if they were equally ancient. It’s really a children’s hospital, specializing in obstetrics, digestive disease and chronic pain. Improvements were done largely without interrupting operations and, in cases where sections could be closed, the schedule windows were very short. During some of the implementation period, 2012-2015, the hospital was dealing with infection outbreaks and local disease epidemics. Meanwhile the upgrade needs were extensive. Ecosystem converted most of the old steam system to hot water, updating old boilers, replacing miles of piping, and also about 900 radiators on six floors. They installed a new externally compounded York CYK heat recovery chiller with two centrifugal compressors in series, for an increased temperature lift and higher condenser temperature output. In general, the new hot water network was designed for the lowest possible hot water temperature to optimize the efficiency of the heat recovery chiller. 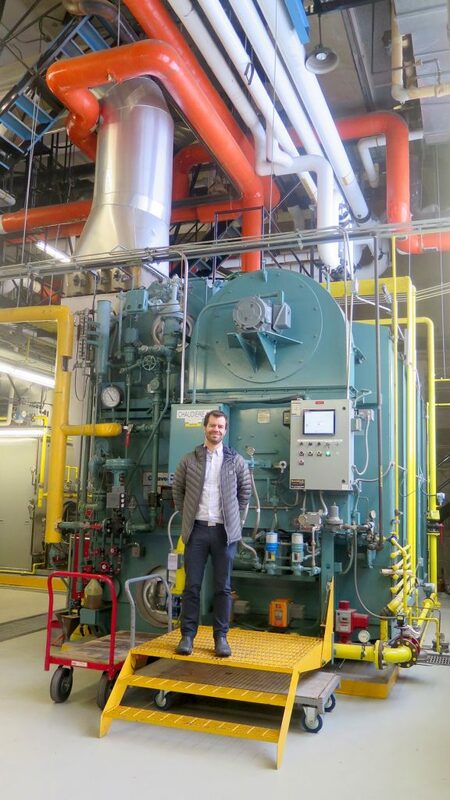 Bertrand with the new 350 hp steam boiler that handles the summer heating load. The main cooling network and many smaller cooling zones originally managed by separate compressors are connected to the cooling loop and the CYK evaporator. The condenser side is connected on the hot water heating loop return, upstream from the boilers. 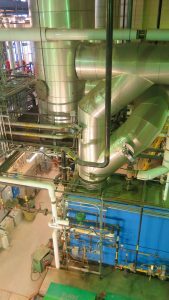 He notes that prior to the project up to 250 tons of cooling was used year-round by conventional chillers and wastefully rejected outside by the cooling towers. They also added a geothermal field that handles about 10 to 15 percent of the heat load, and a solar wall that increases ventilation air temperature by 15F. The solar wall, which wraps around a rooftop penthouse, is about 2,500 square feet. The geothermal field consists of 60 wells, each about 600 feet deep, which potentially contribute 140 tons of pre-warming or pre-cooling. They installed sensors in the laboratory fume hoods to modulate air frontal speed, minimize air and energy exhaust and meet air quality standards. They also optimized ventilation, reducing air changes to about four per hour from approximately 12 previously, when it was 100 percent constant flow fresh air. And they eliminated heating/cooling conflicts and reviewed sequencing to optimize the existing Delta/Siemens control systems. Near the beginning of the project implementation, they undertook a lighting upgrade. “If we were doing the lights today, we would have gone to LED. But they weren’t the best choice at that time (2012). Since then efficiency has increased and the LED price has dropped,” said Bertrand. Simon Verville was project director for the Hôpital de l’Enfant-Jésus project, which included the installation of these 120 HP Bosch Buderus Logano G615 hot water units. At this one million sq. ft. hospital many of the radiators were already hot water, but most of the other equipment had to be changed and, because the institution specializes in traumatology, blood diseases and neuroscience (nervous system), implementation was perhaps even trickier. Cancer wards require constant positive pressure. Some patients have no immune systems. Others are burn victims that are highly sensitive to slight temperature changes. In some areas, supplementary heating was required even during summertime. Special fans and HEPA filters were brought in as well. 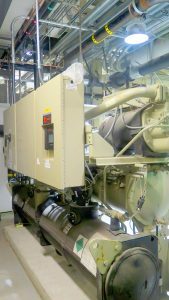 Key changes included the replacement of two 1300 BHP, asbestos-clad steam boilers with eight new 120 BHP Buderus Logano G615 hot water units by Bosch. Again, they were converting to hot water but were able to reuse many of the steam pipes. The condensate system was too small, however, and most of it had to be upgraded. 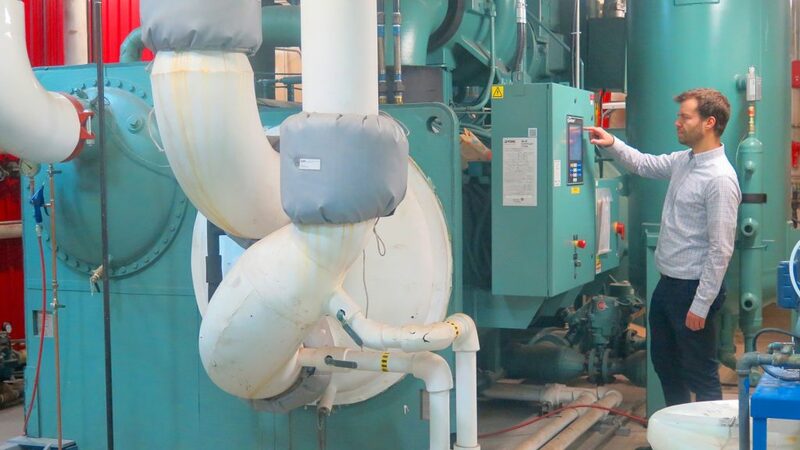 At this site they again implemented a high level of heat recovery, with two new high-temperature Daikin McQuay heat recovery chillers, at about 200 tons each, that can supply hot water up to 160F. The new high-efficiency equipment required changes to piping and ductwork. The project also included a new chiller system. Ecosystem never lost sight of the goal, and they didn’t have to burn their ships.